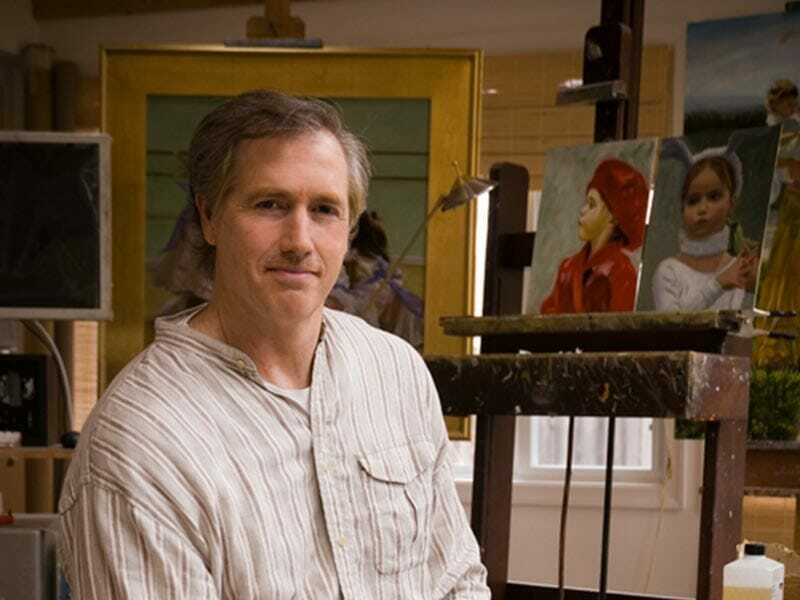 Mark E. Lovett is an international, award winning portrait painter and master oil painter. He is an associate living master at ARC (Art Renewal Center), and is represented by Rehs Gallery NY, NY. Mark receives oil portrait commissions from clients around the globe, and his work has been featured in numerous publications including Bethesda Magazine, Capital File Magazine, Washington Spaces Magazine, Gulf Connoisseur Magazine Dubai, Washington Parent Magazine, Managed Futures Today Magazine, Applause Magazine Strathmore and others. You can read the articles and see the work here. Some of Mark’s portrait clients include: Terraform, Lendlease, SunEdison, Broadsoft, Martek Global, designDATA, Boland, Congressman Bill Livingston, Forrest Whitaker (Academy Award Winning Actor), Gregg Allman of Allman Bros Band. Born and raised in Maryland, Mark began playing guitar and singing professionally at the age of 14 and continued doing so into his thirties. His passion for visual arts did not take root until early mid-life, when he discovered his interest in visual arts. After struggling with alcohol and drug dependence, Mark discovered that his passion for art helped the healing process. Mark’s painting, and his new faith in God, through Jesus Christ, led to a spiritual connection to every painting he creates. While Mark’s music can still be heard on his website or in infrequent live performances, his music became an avocation, while art became his vocation and passion. A graduate of the University of Maryland, Mark studied figurative and portrait painting at Nelson Shanks’ Studio Incamminati in Pennsylvania, The Art League School in Alexandria, VA., and he attended many master artist workshops throughout the country, honing his skills depicting human form and painting live models regularly. Mark strives to create beautiful color harmony with a tasteful but vibrant-color palette, and to fuse same into carefully conceived compositions, using bold strokes, and impasto, yet creating a delicate rendering of the human face and form to capture the essence of his subjects on canvas. Mark’s travels throughout Europe and America have provided inspiration for his images. He works with local models, including one who has been used in many of the famous Pino’s portraits. Who’s Who of Strathmore Worldwide 2007-2008; Preview Magazine Art Expo, NY 2007; Strathmore Applause Magazine cover 2006; Art Business News Magazine 2006 and 2005. Mark’s listings and memberships include the Oil Painters of America OPA; Portrait Artist Society of America; and the International Guild of Realism, Scottsdale, AZ. Mark's portraits are beautifully executed. Mark's sense of composition and poetry of subject is excellent ... as good as the best living artists. it is in the eyes. I love his work. I am crying... I just called my mother crying into the phone because this is not just who she is today but you can see who she will be later. HE IS AMAZING! Mark’s ‘Elise’ is a breathtaking likeness that will give us joy every day for the rest of our lives. His unmatched work exudes compassion, understanding and artistic genius. Mark has a gift unmatched. I appreciate not only his work as an artist but his connection to her as a person. Your work is incredible! The painting of Madelyne in the park makes me want a daughter just so I can have a painting like that! My daughter Addie is the sitting ballerina in your work "Little Ballerinas" I was so overwhelmed by it. An amazing work! Your paintings are incredibly beautiful, depicting the innocence and natural beauty of children and I can only aspire to reach this level. Thank you for the inspiration!